Next month’s Iron Dog snowmachine race is already on the move. Race organizers on Tuesday announced they are moving the start line for this year’s 2,000-mile race across Alaska. Instead of leaving from Big Lake, teams will depart from Deshka Landing near Willow. “It just boils down to safety,” executive director John Woodbury said. “We had a late freeze-up and then we got snow on top of ice that didn’t set up, so we got overflow,” Woodbury said. “And then the Nov. 30 earthquake caused some ripples in the lake. And so instead of starting Feb. 19 on a lake, pro-class Iron Doggers will start their journey on the Susitna River. That means fans at the Deshka Landing start might see speed they don’t always see at Big Lake. Teams will hit the river right away, rather than being funneled onto trails after leaving Big Lake. And they will likely encounter fewer obstacles, whether in the form of trees, pedestrians or recreational snowmachiners. 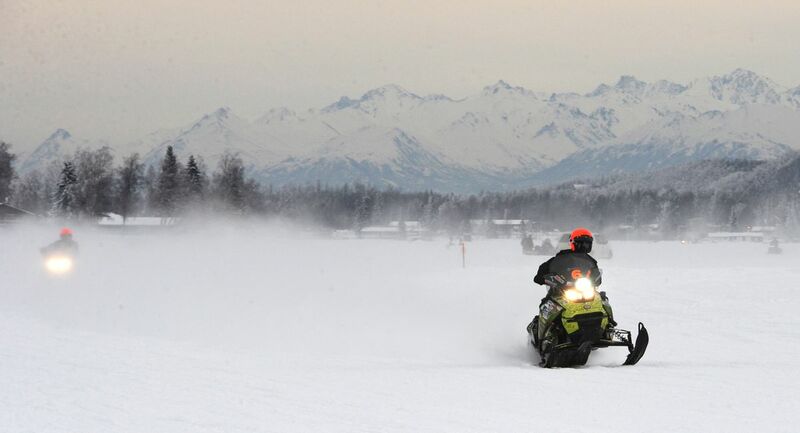 The Iron Dog’s decision to move the race comes less than a month after two snowmachiners died on Big Lake. Reports at the time described conditions as soft, with open water in some places. The Iron Dog typically goes from Big Lake to Nome to Fairbanks. The trail-class portion of the event will start at Big Lake as planned on Feb. 15, two days before the pro-class begins.